The Omega 9000 Juicer - NEW LOWER PRICE!! DISCONTINUED This item has been discontinued. The Omega Model 9000 is based on the Omega 1000 juicer. The Model 9000 has a stainless steel top and carries a 15 year warranty. Omega has built this same basic style juicer for over 40 years. The Classic Looks of the Model 9000 will look attractive in any kitchen, either home or business. The simple touch of White Lustran Plastic and Surgical Stainless Steel is a look that will never change. Motor: The 1/3 Horsepower 3600-Rpm Electric Induction Motor is quietest motor of this style juicer. These brushless motors have very few moving parts that rub together which make them very dependable. 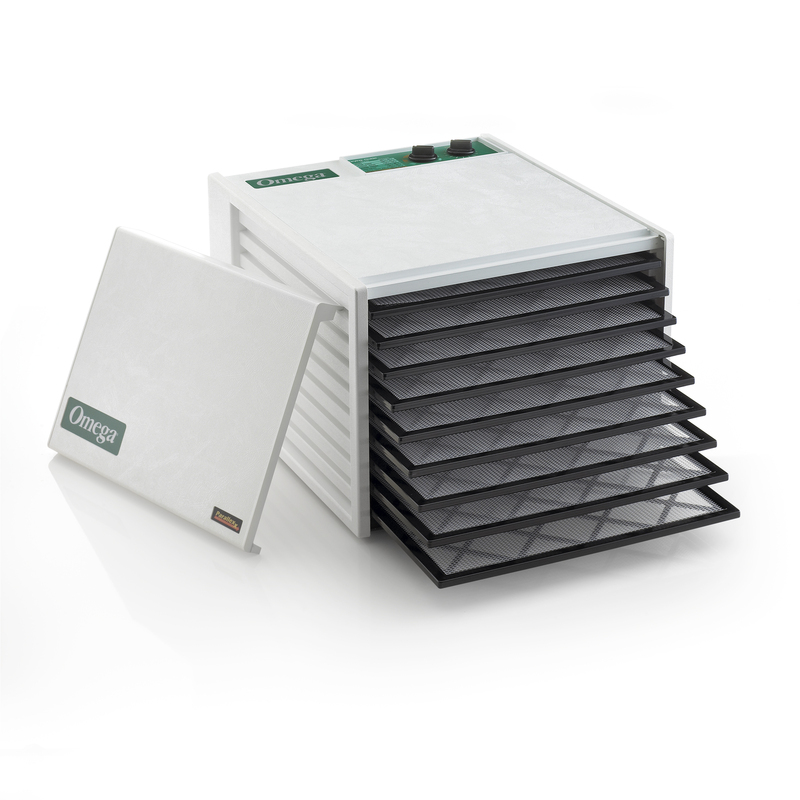 Filters: The Omega Model 9000 can be used with optional non-bleached cellulose fiber filters. These filters will give you a true pulp free juice and let you clean up in seconds. If the filters are not used the clean up is still easy, but takes a little more time. There will also be some pulp in the juice if the filters are not used, but the same amount as most other juicers. Surgical Stainless Steel: The stainless parts are comprised of a heavy gauge Surgical Stainless Steel. All of the Stainless parts are either polished or sandblasted to make the unit look nice and at the same time make it easy to clean. Basket: Each one of our baskets is hand balanced, just like the wheels on your car, to achieve virtually no vibration while juicing a wide variety of fruits and vegetables. The Basket is very open so it is easy to clean. Blade: The Stainless Steel Blade efficiently chews up fruits and vegetables without wearing down. When you hold the blade you'll appreciate its weight knowing how durable it will be. The blade has a plastic ring on the outer edge of its underside that has little feet. These feet help the blade float. The floating of the blade will let the motor keep up its Rpm's while you push down on your fruit or vegetable. This is but one more reason why this juicer has very little vibration. Spring Clutch: The little white knob that holds the blade in place is called the Spring Clutch Nut. This Spring Clutch Nut allows the blade to float. It only has to be put on finger tight. No tools are needed to change or clean this system. Rubber Feet: Your new juicer will stand on a dozen evenly spaced feet. These feet are variable in height, which will help the unit keep from walking across your counter top. Yet soft enough to give the juicer traction while not marking up your counter surface. Latch Arms: Our cantilever style Latch Arms were a first in the industry. This allows for easy assembly and disassembly. Whether you're a strong athlete or suffering from arthritis, these Latch Arms will make it very easy to use this juicer on a daily basis. Warranty: The Omega Model 9000 carries a fifteen- (15) year warranty. An optional citrus attachment converts the Omega Juices into a professional citrus Juicer. It makes it easier to juice citrus, but is not required to juice citrus. Optional paper filters strains more pulp out of vegetable juice (works well for carrots), and makes the juicer easier to clean. Filters are not recommended for juicing fruits. Please note: DiscountJuicers.com does not recommend the Omega 1000 or Omega 9000 machines due to the centrifugal design. This design is one of the oldest juicer designs, and we believe is "outdated". We strongly encourage you to purchase a centrifugal ejection machine, such as the Omega 4000, Omega BMJ330 or Omega BMJ390, which is a much better design. We continue to offer the Omega 1000 and 9000 for customers that are ALREADY familiar with how they work and wish to purchase another. What's the difference between the Omega 1000, 4000 and 9000 machines?